Unicaja captain Berni Rodriguez, who has become the face of the club over his decade-plus of service there, signed a contract extension that could keep the guard with the club through the end of his career. Unicaja announced on Monday that Rodriguez (197, 30) penned a two-year contract extension that gives Unicaja the option to keep him for each of the two following seasons after that. 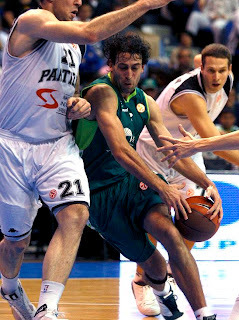 Accordingly, Unicaja and Rodriguez could be together through the end of the 2013-14 season. Rodriguez averaged 6.5 points per game off the bench in the Euroleague last season and 7.8 points in the Spanish League. He holds the club’s career records for games played, minutes, points scored, three-pointers made and assists. He scored his 1,000th career point in the Euroleague last season. Among his career highlights are winning the 2006 Spanish League championship, the 2005 Spanish King's Cup and the 2001 Korac Cup with Unicaja. As a member of the Spanish national team, Rodriguez won the 2006 World Championships and the silver medal at the 2007 European Championships in addition to multiple medals at the junior level.